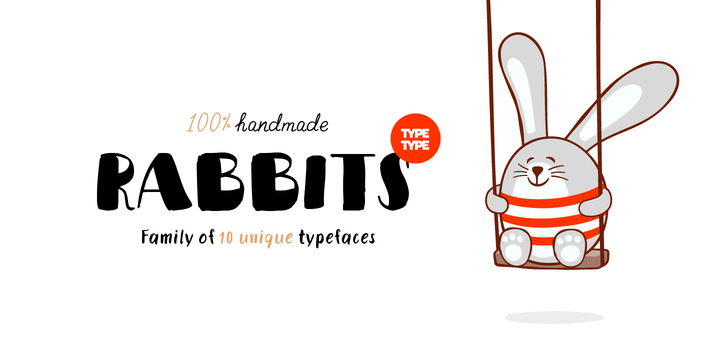 TT Rabbits is a handwritten typeface created by Ivan Gladkikh and published by TypeType which contains 10 different fonts, rabbit with unique name, named by alphabet letters. Absolutely universal set of handwritten fonts, has mostly used currency symbols, all necessary numerals, more than 400 glyphs per typeface and over 70 language support. It is for childen’s products, petterns, inscriptions but also can be use for prodict design, food design…for all situations. Follow the rabbit to discover all typeface! Price: starting from $25 for one font to $200 for all 10 fonts. A font description published on Friday, April 8th, 2016 in Fonts, Ivan Gladkikh, TypeType by Alexandra that has 2,712 views.